I have been hearing this harsh cheh call for a few weeks now while out in my yard. It is a very distinct call – loud and repeated very quickly many times. I knew, by this call, it was a Bullock’s Oriole. A beautiful and very colorful bird of orange, black and white. For many years during the spring, I would see these Orioles flitting around. You can hardly miss the flashes of bright colors nor their noisy vocals. They would fly into my yard and fly right back out. Not much to entice them to stay I guess. This spring I noticed a pair hanging around more than usual and considered that they might be nesting near by. I was hopeful! Both the male and female seemed to like a Hawthorne tree I have in my front yard. I noticed that they would fly into this Hawthorn tree and not any others. 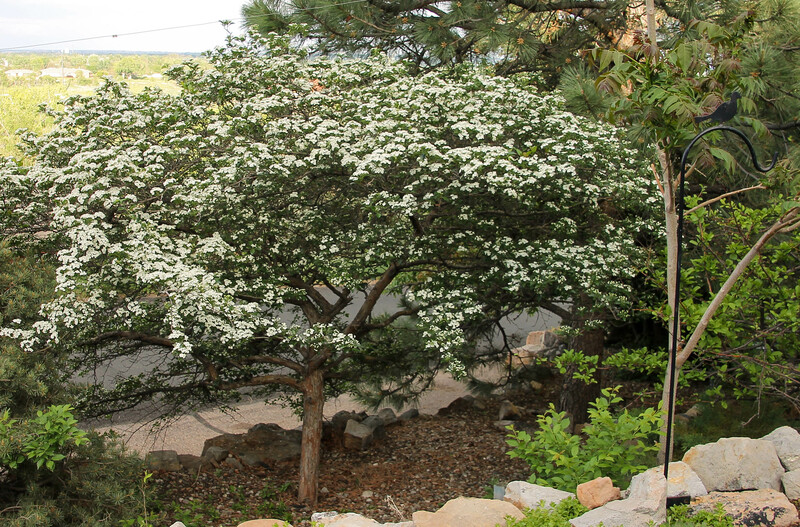 In the spring this tree is simply beautiful with its dark green leaves and clusters of white flowers. In the fall and winter it has bright, red berries. It is what I call an umbrella shaped tree, which to me makes it even more lovely. It seems as these clusters of white flowers reach their peak this tree begins to – stink! Yes, truly stink! This smell must be what attracts the bees and birds. I can’t think of any other explanation for the smell. We planted this tree over 26 years ago. I wanted to see if I could entice these Orioles to stay around in my yard knowing the stinky tree would not totally do the trick. So I did a little research on what type of feeder and food to put out for them. 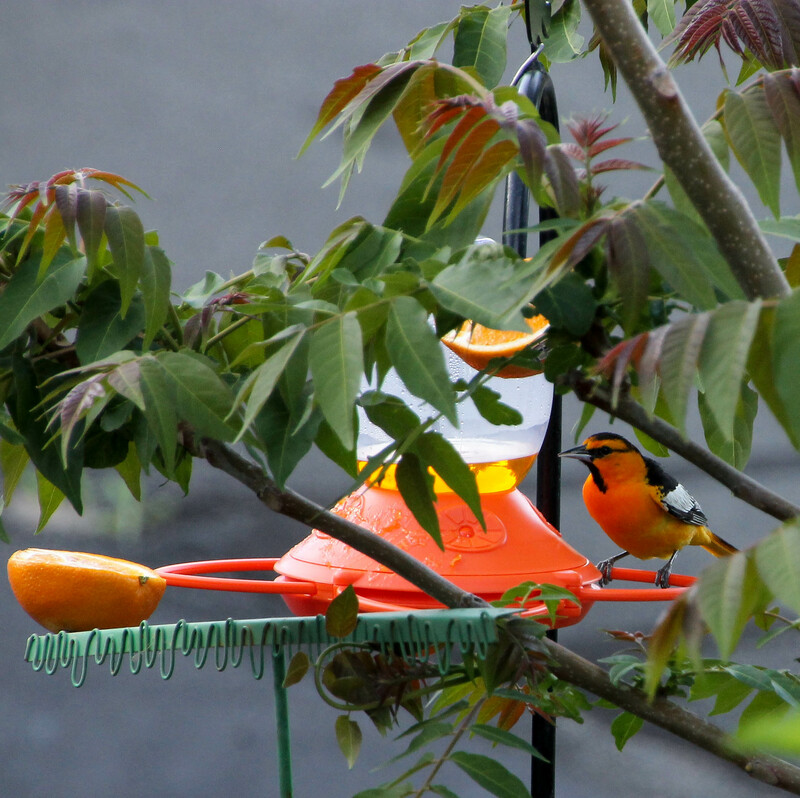 Yesterday, I bought my first Oriole feeder, which is designed just for them. This feeder holds Oriole “syrup” just like the Hummingbird syrup you can mix up yourself or buy already mixed to put into a Hummingbird feeder. The Oriole syrup is “orange” in flavor and color! It smells pretty darn good! I also brought some oranges, cut them in half and placed them near the feeder and the “stinky” tree. During the day today both the male and female would fly into the “stinky” tree and then over to the feeder. Not very quickly as they are very wary birds. They seemed perplexed and would peck on the clear plastic bulb containing the syrup. They did not know how, it seemed, to get to the liquid. With this particular feeder they have to use their bill to depress the covered opening to get to the syrup. For whatever reason, they seemed to be ignoring the oranges. Okay, I’am thinking, what can I do to help them find the spot to depress. After all I had just bought this feeder and I really wanted it to work for them. I remembered they also like jelly. There are jelly jar lids that you can buy, which allows the jar to be hung on a feeder and the birds eat right out of the jar. I did not have a jar holder, but I did have some jelly! I placed a few dabs of jelly over the spot that they needed to depress. What the heck it was worth a try. Well, I don’t know if the dabs of jelly worked or the birds were smart enough to figure it out for themselves. I did see them eating the jelly off the feeder. This afternoon I was delighted to see that I had three male Bullock’s Orioles and one female at my new Oriole feeding station, enjoying their Orange Syrup (finally), Grape Jelly and fresh Oranges. I finally observed them munching away on the oranges. This sighting of three males together was a first in my yard. A little money, a little effort and a little time has resulted in one of life’s little pleasures. Hopefully, I will get some better photos as they get use to this feeding station. Previous PostA Memorial Day Walk…..Next PostDay Trip to Rocky…..
Hi LuAnn, they are striking! Put some jelly and oranges out for them. I looked out this morning when I got up and there was one male at the feeder. I hope you are getting to do your yoga and meditation. I have not practiced since being back home, but it is on my list. Our local gym has classes and I need to sign-up.